Collection of small tables, inspired by the honeycomb. Pure and rigorous forms to which are added details executed with meticulous precision. The various dimensions and heights allow combinations and overlaps to respond to the most diverse requirements of use. The small tables hexagon take on different characters by varying the finishing: rigorous and graphic in the lacquered finishes white and black, precious and with refined elegance in chrome and polished ossidiana. 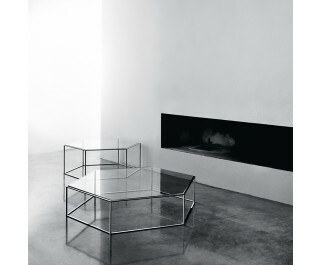 690 Small tables with disassembling steel structure, hexagonal shaped frame, bevelled glass top. 691 Small tables with the possibility to be overlapped. Disassembling steel structure, hexagonal shaped frame, bevelled glass top or metal top.